If you have never witnessed the Hindu festival if Thaipusam, then Singapore is the perfect place to do so. 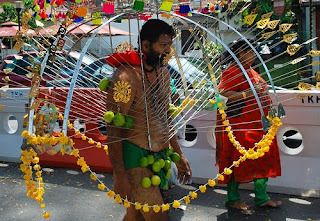 Now banned in India, this amazing festival can only be witnessed here and in Malaysia. The festival of Thaipusam, meaning day of thanksgiving, is of great spiritual significance but also attracts a fair number of tourists and photographers. I witnessed the festival more than 10 years ago when we were backpacking through Asia, and I will never forget it. It was such an amazing, unexpected sight, especially in Singapore which has lost a lot of it's Asianness. In India we came face to face with bizarre awe-inspiring sights every day, but for such a traditional festival to be kept alive in Singapore is testament to the tolerance of all cultures here. Participants carry offerings such as milk pots for the Lord Murugan, god of virtue, youth and power and destroyer of evil. Some participants pierce their tongues with skewers or carry the karvadi attached to their bodies with hooks and spears that pierce the skin to show their devotion to the gods. There are various stages of preparation they have to go through with many prayers and vows to perform throughout the day. On Friday 29th you can see the procession of the Silver chariot of Lord Muruga which begins at the Sri Thendayuthapani Temple on Tank Road off Clemenceau Avenue at 5am, and stops at the Sri Mariamman Temple on South Bridge Road at 6am, and the at the Sri Layan Sithi Vinayager Temple on Keong Saik Road at 7.30am. The procession will continue that evening at 6pm from the Sri Layan Vinayager Temple, passing the Bank of India, Robinson Road (6.45pm), Indian Overseas Bank, Cecil Road (7pm), the Indian Bank, D'Almedia St 97.15pm) and back to the Sri Thendayuthapani Temple on Tank Road at 9pm. The main procession where you'll see the devotee's devotion to the gods, begins early morning (before dawn) of Saturday 30th January at the Sri Srinivasa Permumal Temple on Serangoon Road and ends at the Sri Thandayuthapani Temple on Tank Street, 4km away. The devotees' families usually walk along, cheering encouragement and chanting religious songs. The best way to get to the Sri Srinivasa Permumal Temple is to take the MRT to Farrer Road station and follow the crowds from there. Ther will be tents along Selegie Road for spectators, but it is fun to walk along with the procession and enjoy the excitement and noise.